Well, they told us that the Titans would clash this weekend and they did... in more ways than one. 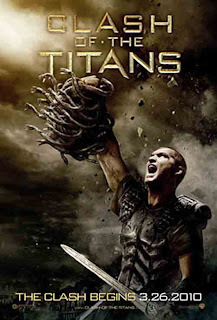 "Clash of the Titans" absolutely dominated the weekend with an estimated take of $61.4Million, which shatters the previous Easter opening weekend record, held by, of all films, "Scary Movie 4". The other story of clashing titans is about how three monster films battled it out to get on those coveted 3D screens. According to Dan Fellman, president of domestic distribution for Warner Bros, "the more 3D screens you have, the better off you are" and "Clash" managed to get on 1,810 of them, which was fewer than "How to Train Your Dragon", but that's because "Dragon" already had exhibitors locked in and they couldn't switch over. "Avatar" and "Alice in Wonderland" were both on far more screens because they were the only games in town at the time. So, why is this a big fight? Well, let's do some math... 3D screens accounted for 52% of the gross, yet only 1,810 of the 6,700 screens were 3D. I'll spare you the math on this, but that means that the 3D premium added around $10Million to the bottom line. Do you think numbers like that will influence the studios? Damn straight, but the problem now turns to convincing the exhibitors to convert their 2D screens into digital 3D screens and THAT, my friends, requires a lot of money. Money that neither side thinks they should pay for. It's definitely an interesting time for the big boys and it should be fun to watch it all play out... Anyhow, let's check in on us little guys and take a look at the horror that's coming out on DVD this week. As usual, you can see all the trailers on our Youtube Page by clicking HERE or you can click on the title and be taken to it's page on Amazon. "Blood Ties" is (or was) a Canadian TV show based on the "Blood Books" by Tanya Huff. It premiered in 2007 and the series revolves around Christina Cox, a former cop, turned detective. She teams up with a 480 year old vampire and their mutual attraction is complicated by her relationship with her former partner, who happens to be her lover. It was a critically acclaimed series, there's a big cult following behind it and the Canadian production company wants to bring the show back, but they're having trouble raising the financing... and now it's been dead for a couple years. My guess, it's done. However, you can now get "Blood Ties: The Complete Season One " on DVD and Blu-Ray. "Taxidermia " came out in 2006 and it's a Hungarian film by Gyorgy Palfi - and I'm missing more than a few accents and squiggly lines over letters in his name there. It's a surreal film that revolves around dark comedy and horror and, most notably... body horror. The film comes highly recommended and apparently it's one of those films that just has to be seen to be believed. So, trying to explain it probably wouldn't do it any justice. Check out the trailer and if it seems like it's your kind of thing, it probably is. "Sensored " comes out on DVD and Blu-Ray this week and it stars the sci-fi legend, Robert Picardo... of "Star Trek" and "Stargate" fame. "Sensored" did the festival circuit and had a lot of buzz. Of note, the film was shot entirely on the 'Red One' ultra-high definition digital camera. I'm not sure if it was the first film to do that, but it was definitely one of the first indie horror films to do that. The film revolves around Picardo, who plays a children's book author that's tainted by his own childhood evils - murderous fixation, delusions and terrifying rampages ensue. "Autumn " is a low-budget indie zombie film that's based on a book series of the same name, by David Moody. The book was published freely on-line, back in 2005, and spawned an entire series. Reviews of the film are somewhat mixed, but the trailer looks great and fans of the book series are very happy with the film. "Tony ", the first feature from Gerard Johnson, looks awfully creepy. It's a gritty depiction of a solitary serial killer that attempts to socialize with the outside world, but all his would-be acquaintances end up meeting their demise. Reviews are great and it looks like a twisted and entertaining film. It's definitely topping my list of films to check out this week. "Blood Red Moon " is a micro-budget film from Scott Patrick and he seems to draw heavily on "Twilight"... and I say that with a grain of salt - check out the trailer. Megan's new in town and she falls in love with a vampire, Victor. There's a rash of murders in town, Victor is suspected and Megan's the only one who believes that he's not responsible. I couldn't find the trailer for "Malpractice " or much else, for that matter, but I love the premise... college students go to their internship at a mental hospital, only to discover that the inmates have escaped and have been running the asylum. Lots of potential with that idea, I hope they do it right. What Would You Sacrifice For Art? Having An Idea Ripped Off... ever happen to you?